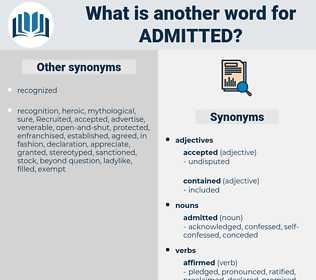 What is another word for admitted? 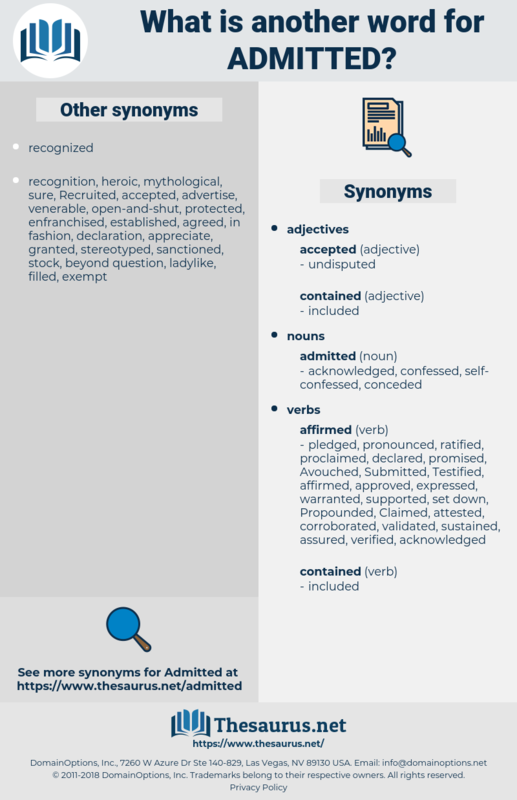 acknowledge, acknowledged, Acknowledging, admiitted, committed, accredited, Testified, admissible, Reiterated, permit, appreciated, adopted, recognize, Recognizing, recognise, recognised, understood, transmitted, Embraced, Acquiesced, affirmed, Mentioned, proclaimed, credited, declared, authorized, validated, Indicated, confirmed, confess, confessed, emphasized, reinstated, added, realized, ratified, conceded, Disallowed, Existed, endorsed, considered, Contended, Introduced, Acceded, determined, Condoned, Told, concluded, authorised, suggested, asserted, Transferred, Transferring, relocated, Pleaded, Pled, tosupported, surrendered, said, granted, established, perceived, acknowleged, Regarded, agreed, Listened, Claimed, invited, revealed, allocated, Concurred, Delivered, empowered, reported, Issued, recalled, Consented, pledged, Catered, Opined, included, Inserted, Deported, Ourselves, Argued, reproduced, professed, handled, qualified, handed, Upheld, Instituted, pointed, renowned, Transported, Provided, welcomed, Enabled, noted, licensed, moved, Entered, remembered, join, joined, started, presented, Attracted, Commenced, co-hosted, Shifted, stressed, Gave, sent, opened, Knew, prior, Caved, conferred, decided, Awarded, read, felt, let, found, turned, Greeted, convicted, Was, Froze, Quoted, Brought, licence, rectified, Began, accords, assured, hosted, enrolled, stated, Passed, checked, Dealt, Had, Returned, Voted, Met, conveyed, called, crisis, Parties, placed, Objected, saw, rushed, Plunged, ruled, Served, Went, formed, Got, imported, Allowed, supported. acknowledged, committed, Administered, accredited, Submitted, inadmissibility, Accommodated, admissible, incorporated, adapted, appreciated, institutionalized, adopted, recognise, recognised, participate, integrated, Tolerated, dissemination, understood, transmitted, withheld, Embraced, prohibited, hailed, Disseminated, credited, entertained, declared, Adhered, realised, designated, authorized, validated, inadmissible, confirmed, confessed, added, assumed, nominated, realized, ratified, Congratulated, ignored, conceded, Denied, identified, Attributed, Excluded, Caught, rejected, endorsed, considered, dispatched, initiated, hospitalized, Introduced, Detained, Adjudged, Acceded, Recruited, Examined, anticipated, determined, Condoned, donated, Told, attended, reorganized, certified, concluded, written, Penetrated, Commended, authorised, subscribed, distributed, restrained, sanctioned, associated, Forwarded, asserted, guaranteed, witnessed, hospitalised, Transferred, imprisoned, relocated, Pleaded, surrendered, recognizsed, evacuated, accessibility, said, granted, established, perceived, mandated, appointed, Displayed, Obtained, destined, sustained, left, Regarded, Inducted, directed, satisfied, discharged, situated, mailed, agreed, confiscated, classified, Claimed, Cited, justified, removed, contained, Patients, acceptable, transposed, traded, Afforded, retained, engaged, receivable, invited, educated, Contributed, ailowed, Installed, allocated, over-enrolled, Delivered, broadcast, embodied, suited, spoken, entitled, Stationed, Embarked, Managed, assisted, interned, observed, Amongst, Declined, Believed, embedded, empowered, Issued, recalled, documented, uncontested, invested, seised, restricted, instructed, clarified, treated, entrusted, Invoked, registered, included, Inserted, learned, hired, Argued, Exempted, chartered, obliged, reproduced, acquired, Deemed, trained, handled, Operated, recorded, resettled, qualified, handed, Visited, attached, Upheld, extended, Resided, Instituted, proprietor, Deployed, pointed, renowned, Transported, inscribed, Provided, employed, welcomed, absorbed, monitored, Enabled, confined, Enjoyed, noted, licensed, settled, moved, upgraded, Entered, remembered, noticed, trapped, derived, joined, started, connected, presented, arranged, Stayed, deducted, reflected, Rewarded, enclosed, Undergone, access, accessed, Attracted, Gained, mobilised, Been, given, avowed, located, featured, opposed, known, collected, Shifted, sheltered, proceed, Yielded, Borne, proven, drawn, input, sent, travelled, opened, Enshrined, built, filled, Tasked, respected, contracted, redeployed, developed, loaded, released, Awarded, Arrived, taken, become, laid, abused, felt, entrenched, let, found, seized, turned, Greeted, convicted, thought, aligned, headed, charged, selected, Followed, licenced, Captured, fed, paid, spent, Quoted, heard, Poisoned, valued, Brought, listed, Exported, cleared, Remained, Begun, Flown, Referred, Lodged, honoured, Accorded, Singled, come, Stepped, elected, branded, broken, Arisen, resolved, earned, hosted, protected, Helped, grown, Lived, required, enrolled, equipped, vested, used, held, Relied, positioned, Shipped, member, Housed, stated, Passed, lawyer, Screened, Prized, fostered, chosen, Launched, honored, Dealt, Carried, Supplied, Subjected, Met, spread, conveyed, called, rehoused, party, signed, put, counsel, Flagged, stored, Convoked, placed, Offered, Cared, Replied, covered, cushioned, packed, ensured, seen, closed, Pushed, rushed, Plunged, won, secured, Levied, processed, ruled, Resulted, HK, reserved, booked, effected, sought, posted, kept, Served, gone, Counted, made, done, Gotten, Got, imported, Allowed, supported.
" I suppose that is true," he admitted. This is a fact admitted on all hands.